San Diego’s ProSound Launches New E-Commerce Website Design! 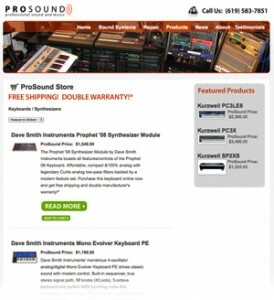 We recently launched an affordable e-commerce web design based on WordPress for San Diego’s premier pro audio company, ProSound.com! We chose WordPress as the platform as it’s open source (read: free), secure and has a low-cost yet extremely robust e-commerce plugin, “Shopp”. We’ve been working with WordPress for 3+ years now and find it to be easily customizable and search engine-friendly, specifically it’s URI structures can be optimized – even for the product pages in the e-commerce aspect, or online store. WordPress also comes with built-in blogging capabilities, which can be imperative if you are hoping to be found in the search engines. The ability for our clients to write blogs directly on their sites is nearly as simple as writing an email, and has capacity for the addition of images, slideshows, videos and other media to make for an engaging user experience. Let’s take a look at the features of ProSound.com! As the three main pillars of service that ProSound provides are electronic and pro audio music gear repair/service, product sales and sound system installations we highlighted these on the home page both in the form of a rotator and with short descriptions and headlines underneath for each. Also found on the homepage of this website design, towards the bottom, are a featured blog/article entry as well as two featured products. These are delivered dynamically, meaning the client can check a box on the administrative dashboard to determine which blog/article and products are to be broadcast on the home page. Pretty nifty! From the navigation, if you click on ‘News’ you’ll see their blog, or article repository. ProSound hired us to write the initial blog entries, which are all search engine optimized using Google’s keyword research tool – the results of which we determine the best keywords to integrate into the writing. Often-times our clients want to have a blog set up only to find they don’t have the time-bandwidth to actually write the blogs! We have on-staff seasoned copywriters who can ‘ghostwrite’ blogs in addition to maintaining FaceBook profiles or Twitter pages. Reference the navigation again and click on ‘Products’ to see the store that we set up for ProSound. The store we have set up for them has search engine-friendly URI structures (in simple terms the URL contains keywords relevant to the product). Many e-commerce solutions cannot boast about this, as their product pages are delivered with URI structures devoid of any keywords and instead back-end codes and symbols that are useless for search engine ranking. ProSound’s store also has search engine optimized META tags for page title and description – also imperative for search engine ranking. A website design is an ongoing process, especially when built on WordPress as upgrades are regularly needed. Design updates, content changes and more must be regularly addressed. The tradeoff is that the client can make updates to their site’s content from WordPress’ administrative interface, called the ‘Dashboard’. If you’d like to learn more about our affordable, best web design and e-commerce solutions in San Diego and beyond, click here to contact us today or call: (619) 309-8537!